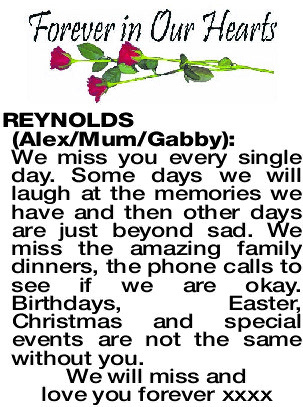 ALEX/MUM/GABBY We miss you every single day. Some days we will laugh at the memories we have and then other days are just beyond sad. We miss the amazing family dinners, the phone calls to see if we are okay. Birthdays, Easter, Christmas and special events are not the same without you.